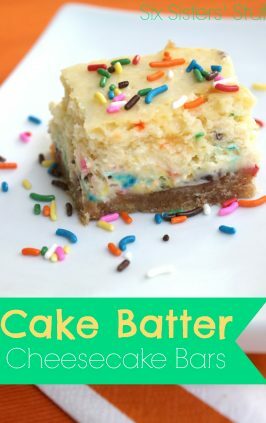 I love finding new recipes that are made with a cake mix! They are so simple, but you can make so many different things with them! I made these a few weeks ago when I went out of town. I left them for my husband to snack on while I was away. When I got back, there was not a single one left! He gave them two thumbs way up, and asked me to make them again as soon as possible. I think you’ll love them, too! 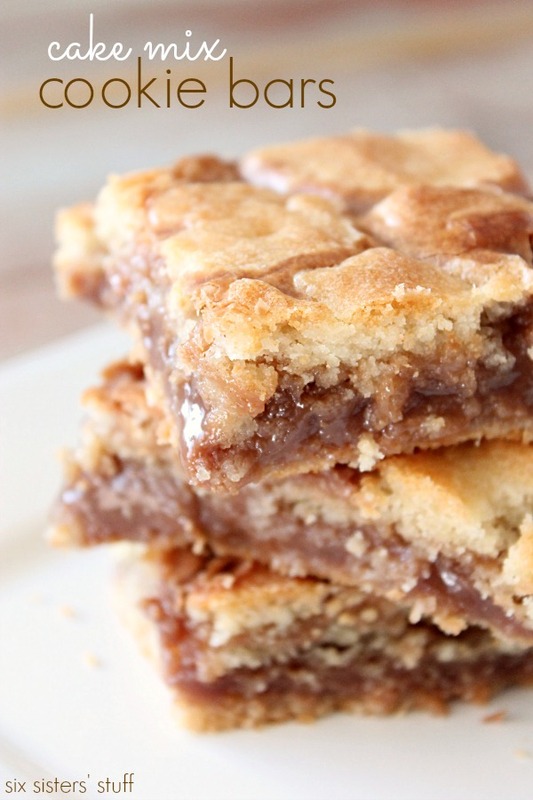 These Cookie Bars are the perfect blend of soft and crunchy. 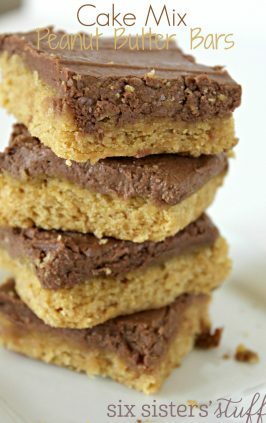 The chocolatey peanut butter middle tastes great mixed with the white cake mix base! 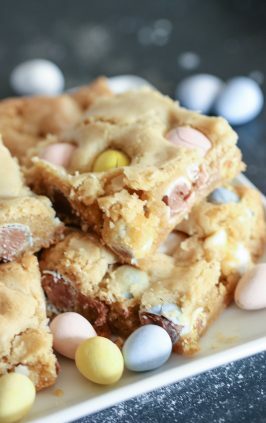 Mix together the cake mix, canola oil and eggs - then separate batter into halves. Press one half of the batter into the bottom of a greased 9x13 pan. In a small, microwaveable bowl, mix together the butter, chocolate chips and peanut butter chips. Microwave for 30 seconds, then remove and stir. Keep microwaving and stirring in 15 second intervals until the mixture is completely smooth. 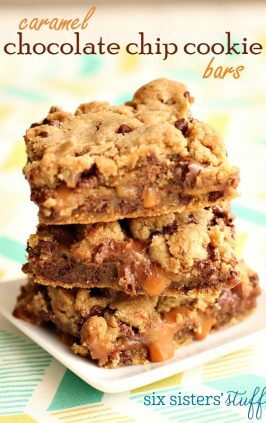 Add the sweetened condensed milk to the chocolate chip mixture and stir until completely combined, then pour it over the crust in the 9x13 pan. Take the second half of the cake mix batter, and drop it in spoonfuls over top. Bake for 20-25 minutes (until the top starts to turn a golden brown). Ah, sweet torture ! My mouth literally started watering at seeing that picture. Great recipe! I have not yet made the original recipe, but have tried it with Spice cake mix and Hershey's Cinnamon Chips. Another variation that I've made is with Devil's Food cake mix and Reese's Peanut Butter Chips. Both were awesome! The spice cake mix version sounds wonderful also! Did you use the 1/2 cup of milk chocolate chips or all cinnamon chips? Thanks! Ann cinnamon chips and saved some to sprinkle on top. Thanks for sharing the recipe! 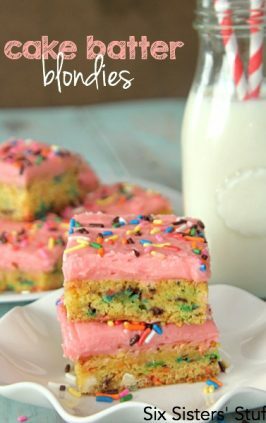 I am making this to bring into work using white chocolate chips and red velvet cake. I just hope it turns out. The cake mix is just sitting in globs across the top and it's about halfway done baking. Wish me luck! Mine did the same thing ? Ok, I had issues with this. I mixed up the box of cake mix with the eggs & oil & had trouble getting it to cover the bottom of the 9x13 pan. I ended up having to use a 2nd box of cake mix to put on the top. It looks like a hot mess! It tastes ok & is ooey, gooey but it just does not look right. Any suggestions? Heidi I am having the same problem--hopefully someone has an answer for us! I used a spatula to flatten the mix out along the bottom of the pan. Could it be that the cake mix isn't the usual largest ounce? See that some boxes are about 11 ounces and formerly were 15+/-. Getting same money but smaller amount. Just like out Facial tissues today! Thanks for sharing this!! I thought that too at first. I sprayed some oil on my fingertips and it was easy to smooth out the smallish amount of batter to cover the bottom and it was plenty thick enough after cooking. Thanks Ivonne! Your notes are a big help. I made these bars just as the recipe is on this website for a funeral this morning. They turned out perfectly!!!!! I made another batch tonight for us. 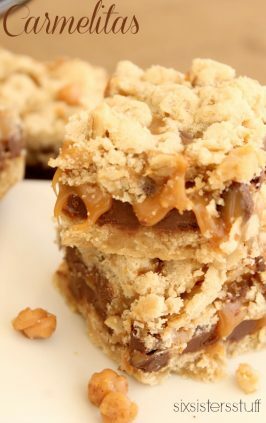 Made these twice now and they are super easy and fantastic tasting. Probably one of my favorite bars! 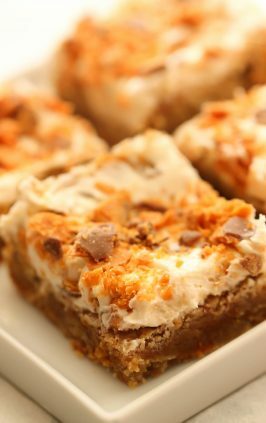 These cookie bars are DELICIOUS I put hafe on the bottom used my fingers to spread it and it worked great. Then for the top I took some dough and flattened it with my hands and layed it on top it works good that way. If you just put globs on top it won't spread out good. At least it didn't for me. This way worked for me!